It’s that time of year again and I couldn’t be happier about it. Spring is a fantastic time of year for riding but one item that can make your ride more enjoyable is a pair of electric motorcycle gloves. Today I’m going to review the VentureHeat 12v Heated Grand Touring Motorcycle Gloves. This pair of Venture 12V Grand Touring gloves is a great buy for anyone looking to combat cold hands without sacrificing comfort or safety. They are almost the exact same as the Venture Epic 2.0 gloves except for the fact that these ones are designed to be plugged into a 12v battery on a motorcycle or other recreational vehicle. 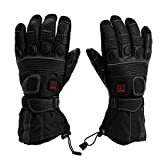 Since these gloves don’t use a lithium ion battery like their Epic 2.0 counterpart they are a little bit cheaper. With that being said, they still aren’t dirt cheap at $151.56 but you get what you pay for and these are worth every penny. These are without a doubt a top of the line pair of gloves. I actually thought that these gloves put off even more heat than the wireless version but that’s not a big surprise since they’re connected to a 12v battery. The warmth is very powerful and they heat up really quickly which is always nice. The heat is distributed all over the back of the hand as well as on the back of each finger all the way to the tip of the finger. The reason they don’t put heating coils on the palm of the hand is because when squeezing a grip or throttle for long periods of time you can actually feel the coils inside and it affects the comfort of gloves. So I actually prefer when motorcycle gloves don’t put the coils on the palm. Don’t let this deter you because the heat output is still very high and your hands will absolutely stay toasty warm with these gloves. They have a nice size gauntlet so that you can effectively keep the wind and moisture out. The gloves are slightly bulky which affects the comfort a little bit but at the same time it helps to keep the warmth in which is usually what people care more about when buying heated gloves. In the warmth category I’m giving these gloves a 20/20. In the comfort category I’m giving these gloves a 18/20. VentureHeat gloves are some of the best in the industry for water resistance. If they say that their gloves are waterproof you know they mean it. They have a great little video demonstration of how they test the water resistance of them, check it out below. As you can see, they take this very serious. The gloves have a Dintex membrane which will keep %100 of the moisture out even in a terential downpour. In addition to being waterproof the Dintex membrane is still breathable so that your hands don’t get clammy and sweaty if the weather improves. I’m giving them a 20/20 in the water resistance category. Just like any other VentureHeat gloves these ones are very well built. You can be sure that as long as you’re treating them with care and respect that they’ll last a long time. It’s safe to say that with Venture you don’t have to worry about the gloves falling apart for no reason. Like any motorcycle gloves they might start to show some wear and tear after a lot of use but this comes with the territory. If you’re doing a lot of off-road riding where you end up crashing or tipping over and lifting up the bike then you might expect to see the gloves wear out a little sooner than expected. I say that because these gloves aren’t built extremely heavy duty like some of Ventures more durable gloves. They are made with a lot of nylon and kevlar which is very durable but the absolute toughest gloves on the market are usually made with Carbon Fiber. As for the electrical parts you don’t have to worry because they are top of the line so you shouldn’t have any problems with them at all. I’m giving these gloves a 17/20 in this category. Some aspects of safety go hand in hand with quality. If a glove is built strong enough to protect your hand in a high speed crash then it will sure stand up to general use very well. These gloves are built with safety in mind without a doubt. They have plenty of extra Kevlar in the high impact zones such as the palm and the knucles. They’re also equipped with some extra insulation for warmth but it doubles as protection as well. They have a good velcro tension strap so that you can secure them on your hand so they don’t come off in the event of a crash. They may not be quite as good as some of the Carbon Fiber gloves but I still consider these to be a very safe glove. Just like the Epic 2.0 these gloves do fit slightly small. You would probably be better off getting one size bigger than you normally wear especially if you’re between sizes. Have a look at our Sizing Guide if you are totally sure what size of gloves you should buy. I really do like these gloves. You would be hard pressed to find a pair of gloves that are better than these in every category. Sure there might be some gloves that rate higher in one category but not in all. You will most deffinitely cure your cold hands with these. I really think these are a good all-round glove and you don’t necessarily need to wear them on cold days only. You can wear these gloves in a lot of different weather conditions and still be confortable. Just switch the heat off with the touch of a button and you’ll be good to ride in relatively warm weather. If it’s really hot out, then you might find them too warm and in that case you might want to have an extra pair of thinner gloves to switch to. I also want to mention that these gloves are touchscreen compatible. Thanks very much for stopping by today and I hope you found this review helpful. If you have any questions about these gloves or any other gloves I’ve reviewed please don’t hesitate to ask. Just use the box below to contact me and I’ll be sure to respond ASAP. They have leather in the high impact areas like the knuckles and the palm. I apologize ahead of time; I know nothing about this subject but looking to purchase for my husband. Do these need to be plugged in all the time while your riding or just when they need a charge ? This is a good question. Actually some of these gloves do need to be plugged in while you use them and some don’t. Under the description of each pair I clarified which type of glove each pair is. There are two types. Wired gloves and Wireless gloves. The wired gloves come with a long wire that hooks up directly to the motorcycle battery. The benefit of these ones is that you never have to charge the battery. The drawback is that they only produce heat when you’re riding the motorcycle and so they don’t provide heat while you’re walking around or doing other activities off the motorcycle. Then there are the wireless ones. These ones have a small battery that fits into a pocket of on the back of the gloves. They will last up to 7 hours depending on the gloves and then you have to charge them by plugging them into a wall outlet using the provided charger. The benefit of these ones is that there are no wires in the way while you ride and they will provide heat even while you’re off the bike or doing other activities. The drawback is that you’ll need to charge them after a day of riding.